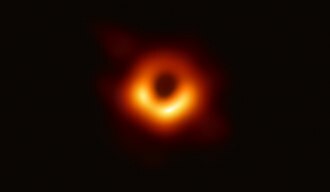 A supermassive black hole (SMBH or less often SBH) is a black hole with a mass that is between 105 and 1010 the mass of the Sun. Scientists are confident that almost all galaxies, including the Milky Way, have supermassive black holes at their centers. How supermassive black holes get started is not yet known. Astrophysicists agree that once a black hole is in place in the center of a galaxy, it can grow by attracting matter and by merging with other black holes. Formation of ordinary (star-sized) black holes from the deaths of the first stars has been extensively studied and supported by observations. However, there appears to be a gap between stellar-mass black holes, and supermassive black holes. Stellar-mass black holes, formed from collapsing stars, range up to perhaps 33 solar masses. The minimal supermassive black hole is in the range of a hundred thousand solar masses. Between these extremes there appears to be few intermediate-mass black holes. Such a gap would suggest that the two types were formed by different processes. Observations show that quasars were much more frequent when the Universe was younger. Supermassive black holes of billions of solar masses had already formed when the Universe was less than one billion years old. This suggests that supermassive black holes arose very early in the Universe, inside the first massive galaxies. Inferred orbits of 6 stars around supermassive black hole candidate Sagittarius A* at the Milky Way galactic centre. The star S2 follows an elliptical orbit with a period of 15.2 years and a pericenter (closest distance) of 17 light hours (7013180000000000000♠1.8×1013 m or 120 AU) from the center of the central object. From the motion of star S2, the object's mass can be estimated as 4.1 million solar masses. 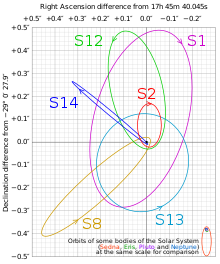 The radius of the central object must be significantly less than 17 light hours, because otherwise, S2 would either collide with it or be ripped apart by tidal forces. In fact, recent observations indicate that the radius is no more than 6.25 light-hours, about the diameter of Uranus' orbit. Only a black hole is dense enough to contain 4.1 million solar masses in this volume of space. The Max Planck Institute for Extraterrestrial Physics, and the UCLA Galactic Center Group, have provided strong evidence that Sagittarius A* is the site of a supermassive black hole. This is based on data from the ESO, and the Keck telescope. Our galactic central black hole is calculated to have a mass of approximately 4.1 million solar masses, or about 8.2 × 1036 kg. ↑ 4.0 4.1 Henderson, Mark (2008). "Astronomers confirm black hole at the heart of the Milky Way". London: Times Online. Retrieved 2009-05-17. ↑ Schödel, R. et al (2002). "A star in a 15.2-year orbit around the supermassive black hole at the centre of the Milky Way". Nature 419 (6908): 694–696. doi:10.1038/nature01121. PMID 12384690. ↑ Ghez A M.; et al. (2008). "Measuring distance and properties of the Milky Way's central supermassive black hole with stellar orbits". Astrophysical Journal 689 (2): 1044–1062. doi:10.1086/592738. ↑ Ghez, A.M. et al (2005). "Stellar orbits around the galactic center black hole". The Astrophysical Journal 620 (2): 744–757. doi:10.1086/427175. ↑ "UCLA Galactic Center Group". www.astro.ucla.edu. This page was last changed on 11 April 2019, at 14:47.